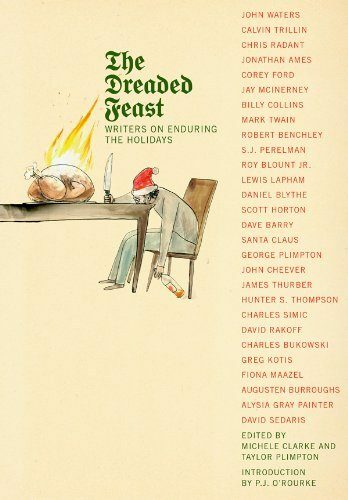 The Dreaded Feast will act as a balm for the millions of people who face Christmastime with a mixture of dread and obligation. Whether it’s the last-minute shopping, the unappealing office party, or the prospect of more than 24 hours with family, it’s never easy. The anthology, which includes fiction, nonfiction, and poetry on these and many more related subjects, deflates the notion of the “perfect” holiday season, and allows the reader to commiserate and bask in the glow of a little dark, neurotic, and unflinchingly honest humor. The star roster of contributors includes Jonathan Ames, Dave Barry, Robert Benchley, Charles Bukowski, Augusten Burroughs, Billy Collins, Greg Kotis, Lewis Lapham, Jay McInerney, Fiona Maazel, George Plimpton, David Rakoff, David Sedaris, Charles Simic, Hunter S. Thompson, James Thurber, Calvin Trillin, and John Waters.